Royal icing is perfect choice for decorating butter cookies and gingerbread houses for the holidays. It spreads easily, hardens quickly and is a snap to make. You can find icing colors concentrated paste at gourmet kitchen shops or hobby stores (like Garden Ridge Pottery) or you can purchase it directly from Wilton. 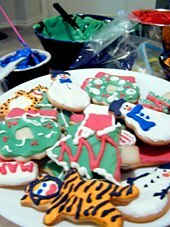 You can use food color to tint icing, but the colors will be considerable less intense. Warning: Pregnant women, the elderly or anyone with compromised immune systems should use meringue powder in place of fresh egg whites. Combine eggs, powdered sugar, water and glycerin in a medium bowl. Beat with an electric mixer at low setting for 10 minutes, or until soft peaks form. Add more water if icing is too thick. Beat for 2-3 minutes more if icing is too thin. Divide icing into separate bowls and tint with icing colors concentrated paste, if desired. This entry was posted on Thursday, September 13th, 2007 at 7:21 am	and is filed under Desserts, Holiday & Seasonal, Master Recipe Index, Speed Queen (30 min/less), Vegetarian. You can follow any responses to this entry through the RSS 2.0 feed. You can leave a response, or trackback from your own site.